The British Cichlid Association (BCA) has been a respected mainstay of the aquarium hobby for around 40 years, and for cichlid hobbyists resident in the UK the group’s 2013 conventions promise to deliver a real treat. 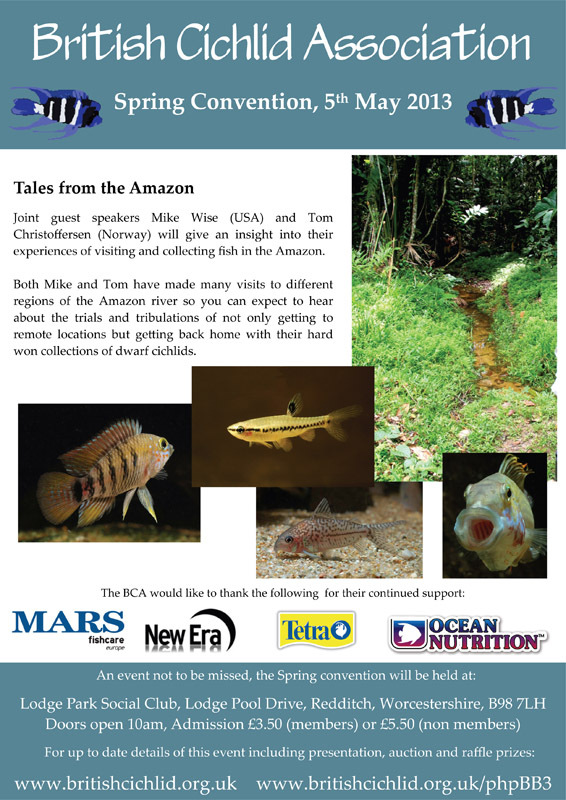 The annual Spring event takes place on Sunday 5th May and should prove unmissable for anyone interested in dwarf cichlids of the genus Apistogramma with guest speakers Mike Wise (USA) and Tom Christoffersen (NOR) among the world’s most respected names in the study and husbandry of this diverse group of dwarf cichlids. Mike and Tom have made a number of expeditions to the Amazon region, and will share their sometimes very amusing rainforest experiences as well as revealing how they transport their fish back home from some of the most remote regions in South America and breed them in their tanks. Check out Tom’s brilliant website for a flavour of what’s in store. The Autumn convention is scheduled for Sunday 8th September and true to form the BCA have selected a contrasting yet equally appealing range of guests for their second convention of the year. First up is well-travelled cichlid enthusiast Ted Judy (USA) who will share details of his collection trips to Gabon in West Africa alongside Dr. Anton Lamboj. A light lunch may be in order, since the afternoon lecture will be chaired by Dr. Peter Burgess, biologist and consultant for a well-known range of fish foods and aquarium products. 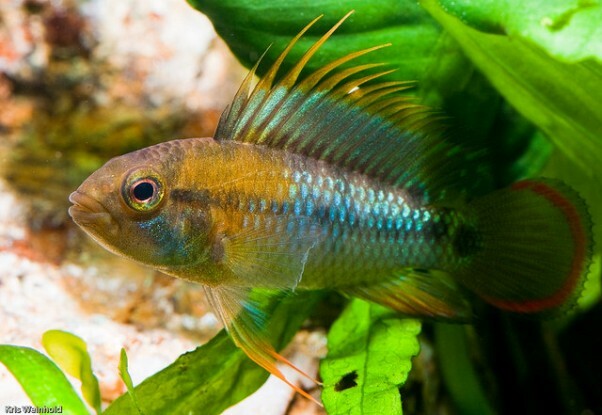 Dr. Burgess will guide attendees through a fascinating and undoubtedly vivid collection of parasites known to infest cichlid species, including the discus, Symphysodon spp., and explain the various options available to eradicate them. Both events take place at the Lodge Park Social Club, Lodge Pool Drive, Redditch, Worcestershire, B98 7LH, with entry charged at £3.50 for BCA members or £5.50 for non-members. In addition to the superb presentations there will also be auctions of fish and other items with some rare species and real bargains to be picked up, plus an extensive raffle sponsored by several leading manufacturers. 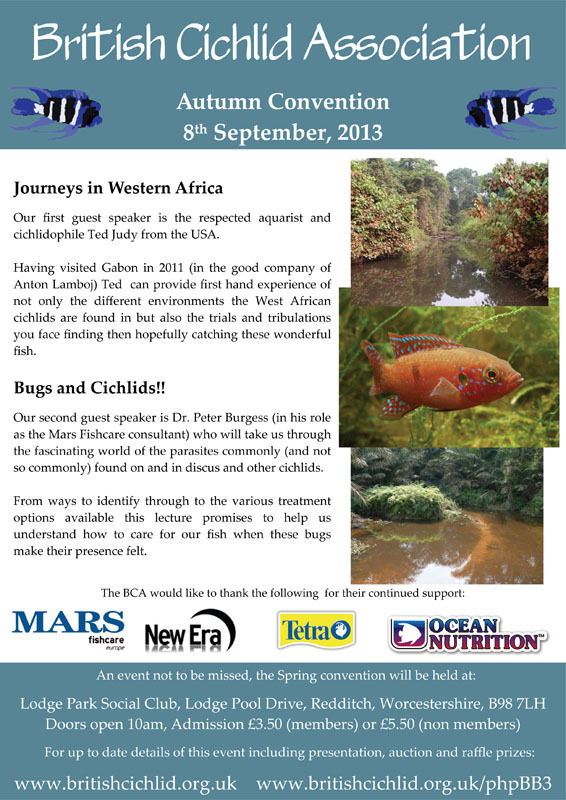 For further information check out the BCA website or their busy Facebook page. As well as their standard membership package the BCA also now offer a special online membership offer at a bargain price, click here for more details. PS: If you’re involved with a club and fancy promoting your activities via SF, please feel free to drop us a line on the forum or by private message. We’re more than happy to feature both national and local events taking place anywhere in the world, so get in touch and spread the word to other hobbyists in your area and beyond!